If the new wave of offbeat cooking shows like the Travel Channel's Anthony Bourdain: No Reservations and the Food Network's Guy's Big Bite and Ace of Cakes are any indication, the average food lover's appetite for unusual or extreme cuisine is growing. Television isn't alone, either; the publishing industry has lately been exploiting this trend toward the exotic. How else can one explain the publication of three recent cookbooks that take "stunt dining" to new, wild, and borderline irresponsible frontiers? In the introduction to Cooking for Cube-Dwellers, the editors explain their book was inspired by an all-too-familiar truth: "Like it or not, most modern American office workers, stressed for time, typically spend lunch hour right at their desks." However, instead of offering quick, healthy, and reheatable lunchtime solutions that can be easily prepared at home, Cooking for Cube-Dwellers takes the solution one step further. All of the recipes are submitted by self-professed "worker drones" across all 50 states (recipes are credited with the cook's name, job title, and corporate employer), and can be prepared and cooked using only the raw materials accessible within one's office. This leads to some inspired solutions, such as the "8.5 x 11–inch" Panini," consisting of bread, deli meat, and cheese scavenged from conference room leftovers, pressed on an industrial-sized photocopier. (The recipe is surprisingly exact, instructing the reader to set the copier to 35 to 40 copies, depending on how long the machine has been warmed up.) Most of the recipes are impractical, unless you're the kind of person who isn't squeamish about using #2 pencils as vegetable skewers or stealing chocolates from the receptionist's candy dish (for a recipe called "Part-Time Chocolate Fondue"). Where Cooking for Cube-Dwellers is functional to the point of reckless, Ringling Brothers Circus's Cross-Country Clown Diet is "do-not-attempt-this-at-home" impractical. Strategically timed with the 2007 Ringling Bros. and Barnum & Bailey Circus, this book answers a question most have probably never contemplated: "What do clowns eat?" What follows is a dark journey into the nutritional underbelly of the American circus. After preparing Chauncey the Clown's "Kung Pao Chicken with Peanuts, Popcorn, and Cracker Jack®" or Professor DingDong's "Three-Ring, Four-Alarm Corn Dog Chili," it is tempting to stop wondering what clowns eat, and start wondering about the average clown's life expectancy. Skip the "Home Brews" section, unless you're morbidly curious about why there are so many sad clowns. Even extreme foodies will likely shy away from Save Your Best Meal for Last: Recipes from Death Row. This collection highlights last meal requests from some of America's most notorious death row convicts, with accompanying essays written by the prisoners themselves, in a style that is unexpectedly lighthearted. For example, the tastelessly tongue-in-cheek recipe for "A-Salted & Battered Scrimps" is described by Tecumseh State Correctional Institution prisoner Don Ed McDonough as such: "A Southern-style twist on a Vietnamese classic. I may be a convicted arsonist, but these scrimps are killer." Recipes like "Popeye's Chicken Rolled Up Inside a Domino's Pizza with a Two-Liter Bottle of Mr. Pibb" and "Toilet Sangria" are interesting for novelty purposes but likely to give even the most adventurous eaters something to bellyache about. Oh, and by the way, April Fool's! Todd Levin is a New York–based writer and comedian. For more of his writing and a performance schedule, go to www.toddlevin.com. Roplast Industries Inc. launches compostable, biodegradable and reusable plastic grocery bag in response to San Francisco's new Plastic Bag Reduction Ordinance. The ordinance will require that grocery stores offer only compostable plastic bags, or recyclable paper bags, to its customers at checkout. Oroville, CA (PRWEB) February 16, 2007 -- Roplast Industries, Inc. today unveiled the B4™ Bag, a compostable, biodegradable and reusable plastic grocery bag. B4™stands for Bio Bring Back Bag. A newly developed Roplast product, the B4™ is made of EnviRo 6400, a biodegradable and compostable film, as defined by the American Society for Testing and Materials (ASTM)'s standard D6400 for compostable plastic. Roplast, a leading North American manufacturer of finely printed plastic packaging, including reusable grocery bags, is offering the bag in response to the Plastic Bag Reduction Ordinance, which was introduced by San Francisco Supervisor Ross Mirkarimi on January 23, 2007. 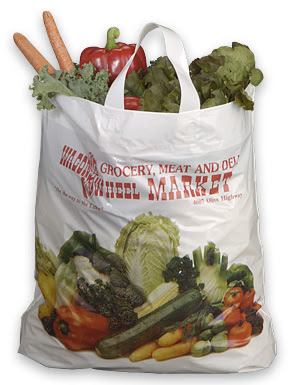 The B4™ is an extension of Roplast's current line of reusable grocery bags. Supervisor Mirkarimi's Plastic Bag Reduction Ordinance calls for a ban on the use of traditional plastic grocery bags in San Francisco. The ordinance will require that grocery stores offer only compostable plastic bags, or recyclable paper bags, to its customers at checkout. In addition to being reusable and compostable, Roplast's B4™ plastic grocery bag is sturdy enough to be reused multiple times. "Nationwide, consumers are actually recycling only a small percentage of recyclable plastic bags," says Robert Bateman, president of Roplast Industries, Inc. "Reusable plastic grocery bags are well established in Europe, and the use of these bags is considered by the European Union and European plastic bag manufacturers to be the single most effective step in minimizing the environmental impact of grocery check out bags. "Ideally shoppers will bring the B4™ bags back to the grocery store several times, and then place them with other compostable items destined for municipal composting facilities," continues Bateman. "The bags can also be used to dispose of food or gardening waste, such as grass clippings, in a compost pile." The biodegradable bags are a distinctive green color to differentiate them from recyclable plastic bags, and to remind consumers to dispose of the bags in the compostable waste stream rather than a recycling bin. The B4™ compostable plastic bags, which can be packed as easily as paper sacks, are designed to carry over 20 lbs., and are as durable as traditional plastic bags. The EnviRo 6400 film degrades by microbial action in the presence of heat, moisture and microbes. It contains over 25 percent of non-petroleum material, including resin manufactured from corn and a readily available mineral, the highest non-petroleum content currently available in resins suitable for commercial manufacture of reusable grocery bags. Roplast developed the EnviRo 6400 biodegradable and compostable film in response to consumer products manufacturers demanding more earth-friendly packaging solutions. According to Bateman, "the main driving force has been Wal-Mart, who encourages its suppliers to offer biodegradable products as part of the retailer's sustainable product program." The B4™ is also designed as an Art Bag, further encouraging purchase and reuse of the bags. These Art Bags offer advertising potential, as well as opportunities for community and student artists to display their work. Modeled after the successful Art Bag program run by Woolworths, a major grocery chain in South Africa, the art gives shoppers another reason to buy the bag and reuse it multiple times. Art selections can involve the local community, whether chosen from school competitions or from works by local artists. "We anticipate that due to its artistic sensibilities, San Francisco will embrace the Art Bag program, like the South Africans have," says Bateman. "Roplast is proud to be part of two initiatives -- increasing the acceptance of reusable plastic grocery bags, and the development of practical plastic products made from biodegradable, compostable films," adds Bateman. "If the products are accepted and supported by the public, and used and disposed of as intended, these initiatives will contribute to lowering the impact of packaging on the environment." The B4™ is an addition to Roplast's other earth-friendly plastic product line that includes the Bring Back Bag ®, also an Art Bag, and Bag for Life ®, which involves the free replacement of used plastic bags returned for recycling. Not only does Roplast produce a line of earth-friendly plastic bags, but it also helps reduce the environmental impact of packaging at its source, during the manufacturing process. Roplast's plant in Oroville is accredited by the California Film Extruders & Converters Association's Environmentally Preferred Rating (EPR) program, as complying with the most environmentally sensitive manufacturing practices. EPR accreditation is an industry "seal of approval," given to plastic makers that meet strict environmental standards certifying that they maintain environmentally sensitive production facilities. MARCH 29, 2007 -- SAN FRANCISCO -- The city's Board of Supervisors here has approved legislation to outlaw plastic checkout bags at large supermarkets and at large chain pharmacies in about a year. The ordinance, Assembly Bill 2449, requires supermarkets and chain drug stores to establish an at-store recycling program that allows customers to return clean plastic carryout bags to a bin at each store that is easily accessible and clearly marked. In addition, they must provide plastic carryout bags printed with a recycling message, provide reusable bags for sale to customers, collect, transport, and recycle all plastic carryout bags, and maintain and make available records documenting these procedures. Those retailers addressed by the legislation must comply by July 1, 2007, and can face civil penalties up to $500 for the first violation, $1,000 for the second, and $2,000 for third and subsequent violations. According to published reports, the 50 grocery stores that would be most affected by the law had argued that the ban was not reasonable, and that alternative plastic bags made of corn byproducts are a relatively new, expensive, and untested product. Manufacturers of environmentally-friendly plastic bags have already began hawking their wares in response to the ordinance. Roplast Industries, Inc., Oroville, Calif. Last month unveiled its B4 Bag, a compostable, biodegradable, and reusable plastic grocery bag. The California Beef Council announced today, that A.J. Spurs’ four locations in Buellton, Templeton, Grover Beach and Marina have been recognized as the recipient of the 2006 California Beef Backer Award. The California Beef Backer Award was established in 2000 and recognizes restaurants that promote beef and the beef industry through innovative menuing, promotions, and delicious beef entrées that draw customers back time after time. Steve Medlen’s House of Beef, located in Oakdale, has also been recognized with runner-up honors in this year’s contest. a California beef producer. A.J. Spurs was nominated by Bill Whitney, a cattle producer from Greenfield. A committee of beef industry leaders reviewed the 2006 entries and based their selection of A.J. Spurs on the restaurant’s beef promotion programs, beef menu applications and overall quality. The first place and runner-up restaurants will be recognized during the California Beef Council’s Annual Meeting in November and will receive cash prizes to be used toward future beef purchases. The original A.J. Spurs in Templeton was opened by Alan Grimley, Jay Walsh and J.G. King in 1989. The restaurant was so successful that the trio opened additional locations in subsequent years. King eventually bought out his partners to become the sole owner of the restaurants. In the summer of 2006, J.G. King sold three of the locations to Milt Guggia Enterprises, Santa Maria, however King continues to own and operate the Marina location. Known for the quality and consistency of their beef, A.J. Spurs has employed full-time meat cutters to help ensure a superior beef eating experience for all of its customers. locations; The Branding Iron in Merced and Buckhorn Steak & Roadhouse in Winters. award-winning restaurant locations will be taking part in a month-long “Beef. It’s What’s For… Free.” promotion. Now, through October 28, any guest that visits one of the past Beef Backer winners’ locations can enter to win a free beef meal. The California Beef Council (CBC) was established in 1954 to serve as the promotion, research and education arm of the California beef industry, and is mandated by the California Food and Agricultural Code. The Council is comprised of 42 members, who are appointed by the California Secretary of Agriculture. The council members set priorities for CBC and represent all segments of beef production within California including range cattle, dairy cattle, feedlots, packers/processors and the general public. For more information, visit www.calbeef.org. Many fruits and veggies make their own natural waxy coating to retain moisture, because most produce is 80-95% water. After harvest, produce is washed extensively to clean off dirt and soil. In this process, most of the natural wax is removed. Therefore, waxes may be applied to replace the natural ones. Waxes are used to help inhibit mold growth, protect produce from bruising, prevent other physical damage and disease, and enhance appearance. Waxes are used only in tiny amounts and completely harmless. Each piece of waxed produce only has a drop or two of wax. These waxes may be mixed with water or other wetting agents to ensure they are applied thinly and evenly. All coatings used on fruits and vegetables must meet the food additive regulations of the U.S. Food and Drug Administration. Produce shippers and supermarkets in the Unites States are required by federal law to label produce items that have been waxed. Waxes may also turn white on the surface of fruits and vegetables if they have been subjected to excessive heat and/or moisture. This whitening is perfectly safe. Next time you are on the produce aisle of your favorite supermarket, notice the commodities that may have coatings. Some may include apples, avocados, bell peppers, cucumbers, eggplants, peaches, squash, and tomatoes. Walt Clark says "Talking Trans Fats without Discussing Total Nutrition is Confusing The Consumer"
Is all this talk about Fat getting to you? Polyunsaturated fat, Monounsaturated fat, Trans fat and saturated fat…. Frankly it can be over whelming, not to mention very confusing. In fact, it can be so confusing that many sales people don’t even want to bring the topic up with a customer. Just sell them the same old oil and let it go at that. • Cardiovascular disease (CVD) is influenced by a number of factors…… Diet being one. Fat intake and the TYPE of fat ingested also influences CVD. The reduction of Total Fat, Saturated Fat, Trans Fat, and Cholesterol is another one. Research indicates that the type of fat may be as important as the quantity of fat consumed in reducing Cardiovascular disease, (CVD). • Cholesterol is primarily made up of two main proteins…… or LIPOPROTEINS…..LOW DENSITY LIPOPROTEIN, (LDL), AND HIGH DENSITY LIPOPROTEIN, (HDL). • High levels of LDL have been shown to increase the risk of coronary heart disease, (CHD). This is caused by the cholesterol depositing on the artery walls. HDL on the other hand has been found to be beneficial because it appears to remove serum cholesterol from the blood stream and return it to the liver for breakdown and excretion. • Generally diets high in Saturated fats will increase total cholesterol as well ad LDL and HDL Cholesterol, (see chart above). • Polyunsaturated fats will lower both the serum cholesterol as well as both LDL and HDL cholesterol. • Monounsaturated fats help lower total serum cholesterol, decreases LDL but will increase HDL. This improves the ration between the LDL and HDL which is a positive. • AND, several studies have shown that Trans fats increase LDL and lower the HDL thus worsening the ratio between the two. SO, what does this mean to you the Customer ??????????? It should help you select No Trans Fat identity preserved oils. • Look at the TOTAL NUTRITIONAL VALUE of the oil, not just the TRANS FATS. • Products such as Frymax has a very low Linolenic acid level, (generally less than 1%), This low a level of linolenic acid tends to lead to shorter fry life. Compare the saturated levels and trans fat levels. Low linolenic acid SOY oils will have a Saturated fat level around 11 to 12 %, where as Optimax has a Saturated fat level in the 7 – 7.5%. THUS the low linolenic acid SOY oils have approximately a 57% greater SATURATED FAT LEVEL. OPTIMAX wins! • The inexpensive grades of stainless are made from 18/0 stainless steel. • The term 18/0 means the stainless steel contains 18% chrome, 82% steel, and no nickel content in the alloy. • Also called 18 Chrome. • Use of chlorine-based products may cause discoloring. • Fine and medium grades of stainless are made of 18/8 or 18/10 stainless steel, which preserves its brilliance longer and provides superior resistance to attached food and cleaning chemicals. • The term 18/8 means the stainless steel contains 18% chrome, 74% steel, and 8% nickel content in the alloy. 18/10 means the stainless steel contains 18% chrome, 72% steel, and 10% nickel. • A simple way to test for 18/8 or 18/10 is by touching it with a magnet. A magnet will not react to 18/8 or 18/10 stainless, but it will stick to other stainless products without the nickel added. • The rich blend of chrome plus the nickel in 18/8 or 18/10 stainless results in even greater protection against corrosion, with the added benefit of a warm silver-like appearance. This will keep the luster for the life of the piece. Note: All knife blades on hollow handle knives and all 1-piece knives come from 13% Chrome, with no nickel added. This is due to the need for a serrated and sharp edge. The addition of nickel makes a knife difficult to hold a sharp cutting edge. • While stainless steel is highly resistant to stain and corrosion, even the finest alloys will suffer if you do not remove eggs, vinegar, and acids found in foods by soaking, washing, and rinsing thoroughly immediately after they are used. • Watch how much low temperature chemicals your staff uses. This is an area where if you use more low temperature chemicals than shown on the chemical bottle label, it will not do a better job. Too much of these chemicals will destroy their flatware. Especially watch the presoaking process where they may leave flatware in the chemicals for prolonged times, as this process can damage the flatware. In anticipation of the new pack Tiger Shrimp season which begins in May and runs though July, Peninsula Foodnews traveled with Zeljka Boyd of Contessa Premium Foods, David Brinker of Foodsales West Partners and broker for Contessa Products, and Mike Salas of Empress International as they made their way through some of the Central Coasts most Prestigious Hotels. 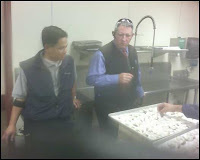 Executive Chef Rod Uncango of The Inn at Spanish Bay discusses intricacies of tiger shrimp at a comparison cutting. Contessa Shrimp was first compared against the Pacific Gold label product at several locations. The Contessa Brand was a better known product and did extremely well versus Pac Gold based on color, texture, and flavor. Chef Benjamin Brown of the Beach and Tennis Club at Pebble Beach brought up some concerns about Contessa as the shrimp is farm raised in Vietnam. Specifically he was brought up news reports about dioxins in seafood from Vietnam that were the result of Agent Orange used during the Vietnam war. Zeljka subsequently provided results of 3rd party testing done in 2004, and 2005 that found no detectable results for Agent Orange or Dioxin. Next Mike Salas from Empress International brought out their flagship Xcellent Brand and the Harbor Banks Brand to compare with the Pacific Gold Brand. Certain Specifications were called for during this comparison. We were to compare raw, peeled and devained tiger shrimp in a 13/15, 16/20, and 21/25 per pound count. Although the Chefs’ were under the impression that the Pacific Gold product contained no Tripolyphosphate, it became apparent when thawing under running water that there was. 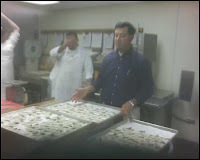 Two key indicators were the level of foaming that occurred as the shrimp was washed, and the heavily bleached appearance of the shrimp after thawing. Xcellent brand and Harbor banks had traceability back to to the harvester with respect to water conditions and feed where the Pac Gold did not. Xcellent and Harbor banks had excellent coloring, both graded #1 quality product where the Pac Gold was not graded on the bag or on the case. Xcellent and Harbor Banks had drained weight per pound count sizes that averaged on the larger size shrimp meaning better plate coverage keeping plate costs down. All three brands had good uniform size per case. Space Food Sticks are a living monument to golden years of the Space Age. In the formative years of space travel, food represented a major hurdle for NASA technicians. Keeping it fresh, tasty and safe was tricky business. The first brave souls who flew in space (better known as "the guinea pigs") were given an unappetizing choice-cubes covered with edible gelatin or semi-liquid food puree squeezed out of a toothpaste-like tube. The result was summed up by one newspaper headline: "Space Food Hideous-But It Costs A Lot." Hideous or not, the public was eating it up, or in the case of Tang, drinking it in abundance. When junior space travelers discovered Tang was being used by the space program, sales of the instant breakfast drink skyrocketed. The Pillsbury Company, which had been lending its support to NASA, saw an opportunity to catch a little "moon fever" for their company. Their efforts lead to the creation of Space Food Sticks. A battery of food scientists at Pillsbury, lead by Dr. Howard Bauman, whipped up an energy stick that was actually edible. The long chewy stick could slide into an airtight port located in an astronaut's helmet to provide essential nutrition in case of an emergency. Pillsbury released a commercial spin-off of their cosmic creation, imaginatively dubbing the product Space Food Sticks. Described as a "non-frozen balanced energy snack in rod form containing nutritionally balanced amounts of carbohydrate, fat and protein," the original energy bars came in several flavors including caramel, chocolate, malt, mint, orange and the ever-popular peanut butter. Aficionados will recall that the Space Food Sticks were wrapped in special foil to give them an added space-age appearance. The downfall of Space Food Sticks began after the energy crisis of the mid-1970s when the space program took a back seat to other pressing issues. The product’s profile was further reduced when Pillsbury dropped the Space and distributed them as Food Sticks. The word energy bar hadn’t been invented yet. Slowly but inevitably the fabled Sticks gradually disappeared from supermarket shelves. The second (and just as improbable) part of the story begins in the year 2000. That was the year Eric Lefcowitz launched his website www.retrofuture.com. One of the articles featured on his site called “Let Them Eat Fake!” looked at futuristic foods including Space Food Sticks. Eric noticed that hundreds of Google hits for his site were coming from curiosity-seekers searching for any info they could find on the tasty astro-snack of their youths. On a hunch he launched Spacefoodsticks.com and founded the Space Food Sticks Preservation Society. Thousands of heartfelt memories poured in which were posted on the site. Eventually the demand for a full-scale re-launching of SFS in the USA grew. After much trial and error, Eric joined forces with Mario Medri, a world-renowned food scientist and Kalman Vadasz of Richardson Brands to recreate the taste and texture of the beloved Sticks. Finally, in October 2006 two flavors of Space Food Sticks—chocolate and peanut butter—were launched by Retrofuture Products, satisfying the cravings of longtime fans and winning a new generation of Sticks fans in the process. Despite the odds, Space Food Sticks are now alive and well in the 21st Century. 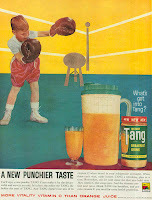 Tang was trademarked in 1957 (U.S. Patent & Trademark Office registration #1974439) and introduced to the American public in 1959. It was invented as a modern breakfast beverage, not commissioned by the U.S. space program. It was, however, the space program that made Tang a household name. In 1965 the Gemini astronauts took this drink into outer space. "Tang, made by General Foods, is a sweetened drink powder artificially colored and flavored orange. It is one of America's most celebrated chemically created foods...Tang went to space on the Gemini and Apollo missions. The mix was delivered to the astronauts in silver pouches. When water was added, the pouches yielded a sweet, slightly tangy orange-flavored drink that provided the entire day's worth of Vitamin C. By the first Gemini flight in 1965, Tang has been languishing on supermarket shelves for six years. The General Foods dubbed it "the drink of the astronauts," and the new Tang, with a prominent picutre of a launch pad on the outside of the canister, soon was rocketing upward in sales and consumption...At the peak of popularity of Tang in the 1960s and 1970s, American households consumed the "instant breakfast" on a regular basis." "For the record, the drink's origin had nothing to do with the space program. It was developed by General Foods in 1957, 12 years before man would set foot on the lunar surface. But the Vitamin C-filled drink is indelibly tied with outer space, largely because it has been used by astronauts since the Gemini flights of 1965 - and because of advertising. "Tang Takes Off" bleats a 1965 General Foods newsletter that describes the elaborate efforts to craft commercials tied to the Gemini flights. Later commercials and ad promotions - from moon maps sent to thousands of schools to lunar module replicas on 18-ounce Tang jars - would reinforce the Tang-Space connection for years. Once widely popular, Tang is no longer the major player it once was. "Its sales are not now what they were then," said Nancy Redmond, a spokeswoman for Kraft General Foods. She attributed that mainly to changes in consumer tastes and the availability of other drinks. Still, Redmond said, "Tang has its dedicated users." It's also now available in mango flavor and sugar-free orange. Plastic containers have replaced the old glass jars. And Tang is still used regularly in space. " "Tang is yesterday's drink of tomorrow. Introduced by General Foods in 1959 as a "breakfast beverage" made by mixing water with a spoonful of what the manufacturer called "aromatic, orangy-tasting powder," (loaded with vitamins A and C, as well as tricalcium phosphate), pleasant smelling ("like oranges, but with a flavor all its own"), long--lasting in its jar on the shelf, and, most wonderful of all, modern. 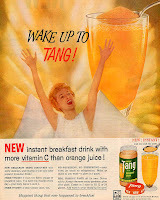 To serve Tang for breakfast instead of orange juice was to say you were riding high on the wave of progress...To understand Tang's appeal some thirty years ago, it is necessary to remember that most Americans, especially in the 1950s and 1960s, put their faith in the march of progress. From the end of World War II until the 1970s, a lot of people honestly believed that the world was simply getting better and better, mostly because science and industry kept creating great new products and evermore convenient ways of living. ..when Tang was first marketed across the United States (and as "Sun Up" in Canada), General Foods was still predicting a dazzlingly modern future menu of scientifically reconstituted foodstuffs...It hadn't been easy to create a powdered breakfast beverage rich with the attributes of real fruit, the introductory articles in May 1959 [issue of General Food's Monsanto Magazine] explained. Among the obstacles faced by scientists at the Post Division of General Foods were betting stable, water-soluble forms of vitamin A into the powder, finding just the right semiopaque orange additive...and finding a way to keep the powder from caking in the jar. When it came time to package Tang, marketing people took an unusual step (for 1959) and created a label that actually told consumers what nutritional value they would get in every glassful of Tang...Tang made the leap from convenience food to pop culture in 1965 when it was taken on board the space capsules Gemini IV (June 7) and Gemini V (August 21) as part of the astronauts' nutritionally balanced food supply..."
The Tang brand is currently owned by Kraft Foods. It is available in more than thirty flavors (some region-specific), and is sold both in powdered form (in sachets and larger canisters) and in a ready to drink sachet. A single 8 oz serving of Tang provides 92 calories, 60 mg of vitamin C (100% RDA), and no caffeine. Kraft also makes a sugar-free version of Tang, containing aspartame, which comes in individually-measured packets and was introduced in March 1985. Tang usually comes in a plastic container with a screw-on lid that makes six quarts. A larger nine-quart container (898 grams) is available. Tang is also available in larger institutional sizes. The recommended usage is two tablespoons per 8 ounces of water. The lid on the plastic container also acts as a measuring cup which may be used to make one or two quart quantities. Tang now comes in smaller, more concentrated mixes. The new containers are 12.3 oz (348g) and make 8 quarts. The recommended usage is two and a half teaspoons per 8 ounces of water. "... There was a particular component of the Gemini life support-system module which produced H20 (water) among other things. This was a byproduct of a reoccurring chemical reaction of one of the mechanical devices on the life-support module. The astronauts would use this water to drink during their space flight. The problem was, the Astronauts did not like the taste of the water because of some of the byproducts produced, which were not harmful of course. So, they added Tang to make the water taste better ..."
One recipe for making Tang is to heat it, as one would make hot chocolate. "We have heard that some consumers have used TANG Drink Mix to clean their dishwashers. TANG does contain citric acid which can act as cleaning agent. TANG Drink mix is intended to be a food product and Kraft Foods does not advocate its use for any other purpose." The inventor of Tang, William A. Mitchell, also invented Pop Rocks, Jell-O, and Cool Whip. Several US presidents have been known to enjoy Tang, including Lyndon Johnson, Jimmy Carter, Ronald Reagan, and Bill Clinton. On Married with Children, members of the Bundy family in one episode made "Tang sandwiches". If there were not enough for a sandwich, they would have "Tang wipe" (a slice of bread wiped in the jar to absorb the residual Tang). On an episode of the 1993 cartoon series 2 Stupid Dogs, the two dogs wander into a spaceship looking for a block of ice cream. Another spaceship has an astronaut and a monkey inside, and the monkey says, "I think you've been drinking too much Tang." In the movie The Coneheads the two aliens mention Tang being the drink that the astronauts take to the moon, then laugh about humans going to the moon. In an episode of That 70's Show, aspiring astronaut Michael Kelso remarks "Girls must really love astronauts: it says here they get all the Tang they want!" In another episode of That 70's Show, Eric Forman's mother makes him "sausage and Tang" for breakfast. Eric comments that "sausage and Tang" is a bit racy for breakfast. Not getting the joke, his mother becomes confused and makes the comment "growing boys need Tang", still unaware of its meaning. In the Simpsons episode "Deep Space Homer" Homer rings NASA and President Clinton looking for some Tang. J.M. Smucker Company was founded in 1897 when the Company's namesake and founder sold his first product--apple butter -- from the back of a horse-drawn wagon. Today, over a century later, the Company is the market leader in fruits spreads, peanut butter, shortening and oils, ice cream toppings, health and natural foods and beverages in North America under such icon brands as Smucker's®, Jif® and Crisco®. For over 107 years, the J.M. Smucker Company has been headquartered in Orrville, Ohio, and has been family run for four generations. The J.M. Smucker Company was recognized as the top company in FORTUNE Magazine's 2003 annual survey of The 100 Best Companie to Work For and has ranked consistently in the top 25 companies each year since FORTUNE began the list in 1998. The J.M. Smucker Company has over 4,500 employees worldwide and distributes products in more than 45 countries. 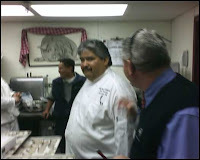 On Tuesday afternoon Ron Arguello of MarketSmart, Carolina Purvis of JM Smucker, and Brian Isaeff made a call on Chef Rod Uncango at the Inn at Spanish Bay, Pebble Beach. Although the properties at Pebble Beach have used Dickinson Preserves in the past, they have been using Bonne Maman mini preserves in their operation and this was an opportunity to reintroduce them to the product line. What Dickinson's brings to the table is over 100 years as the best selling domestic gourmet preserve. In fact every year American's consume one and a half million pounds of Dickinson's Gourmet Preserves, according to their website. While other brands of preserves may source varying grades of domestic and offshore fruits, Dickinson's only uses premium American grown varietal fruits and pure high quality ingredients. The distinctive packaging and display racks available for customers were additional benefits of this product line. 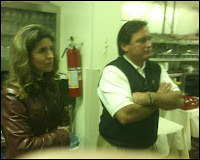 Tuesday morning Diana Garza of Kraft Foodservice was in town to help our customers earn more money. With her bundled savings offers she showed several customers how to earn from $20.00 to $500.00 in rebates on cream cheese alone. 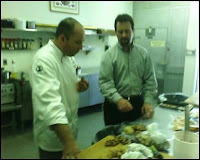 In addition to customer rebates, incidently, KraftFoodservice.com has some fantastic customer tools and business services. From the site customers can order much of the Point of Sale tools, and read up on industry trends. Be sure and read about what Kraft is giving back in terms culinary programs and sponsorships. This is a great company with which to do business. Kraft dressing line 1.5 oz. packets give customers just the right amount of dressing. Available in 5 new flavors; Signature Balsamic Vinaigrette, Signature Creamy Caesar, Catalina, Honey Mustard, and Light Done Right Ranch. Kraft Snacks including Planters 2 oz trail mix packs. Fruit and Nut, Nut and Chocolate, and Cajun Mix. Of course all of the portion packed items that Diana showed had corresponding table top or hanging racks for display and storage. Diana left me with samples of the another new item. (Probably the last time she will leave me with a sample) This was the "New"
TANG Sport fitness Drink Mix with electrolytes provides a refreshing beverage option for active people. 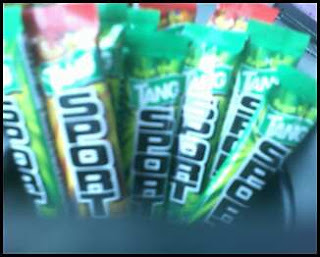 A perfect way to hydrate, TANG Sport helps replenish electrolytes that may be lost during physical activity. These electrolytes also help maintain fluid levels by stimualting thirst and encouraging voluntary drinking. - Packaged in a convinient stick pack. - Available in two refreshing flavors, Lemon Lime and Fruit Punch. - Has zero calories per serving and is sugar free. - Fortified with vitamin E, vitamin B6, niacin and riboflavin. - Contains a full day's supply of vitamin C per serving. I couldn't help myself, and I appologize Diana. Every customer I sampled these too I introduced them as the "drink every female Astronaut carries in her car while driving 900 miles across country, wearing an Astronaut diaper, on her way to kidnap her fellow female Astronauts." I was only joking but I did recieve an email later from someone purporting to be with a Florida impound lot that recieved the Astronauts car..and this picture of the drink holder was attached. Monday I picked up Greg Troutman from Hoffmaster and Mark Calestini of M & D Sales for a ride along through Monterey and Pebble Beach. 1 - 1 ct. Napa Valley Table Accent 33"x33"
1 - 1 ct. Napa Valley Plastic Tray 7"x10"
One of the hot new items is this pre-packed Napa Totes. Available sometime around May 1st it is "picnic ready". I'm seeing this as a hot item for hotels, spas, caterers. Add wine and cheese and it's ready to go for a group outing. Another item that has been around for awhile but is under appreciated it the Caterwrap pre-rolled cutlery. Takes the work out of upscale offsite catering or banquets by offering grab and go convenience. 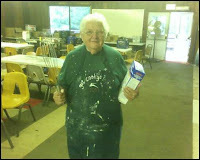 Of course Hoffmaster will completely dress out your tables while you concentrate on your culinary masterpiece. Although we didn't spend much (any time) on it this trip, Mark also handles the GSD packaging line much better known as Bio-pak and Fold-pak containers. Great for catering and gift boxes. Now I was really impressed by the totes mentioned above, until I went to the Hoffmaster website and found the "Black light" party items! Thats right they offer custom print Placemat, 17x17 napkins and 10x10 napkins with a psychadelic blacklight feature. Look out blacklight bowling alley's and Ocean's 18 Golf..I ordered my samples today! Blue Crab products they are sourcing from Mexico. He will be sampling the colossal crab meat and the Majestic Blue Crab claw “Fingers”. According to Dave this is “the closest crab meat taste to the blue crab that comes out of the Chesapeake Bay in Maryland. Phillips Crab Meat is from the blue swimming crab (portunus- spp). The crabs are harvested from the tropical waters of Southeast Asia, cooked, hand-picked and pasteurized at Phillips' own crab processing plants under the strictest quality control. The result: virtually shell-free, sweet crab meat that has a shelf life of eighteen months in the black metal can and one year under proper refrigeration. 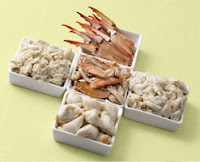 Phillips Crab Meat is available year round in five grades: colossal, jumbo lump, backfin, special and claw. Available in 1 lb. cans. Colossal and jumbo lump are perceived as the "Rolls Royce’s" and "Bentleys" of crab meat, though they are the most commonly misused grades of crabmeat. While the lumps are large and the meat is white, colossal and jumbo lump are best used in upscale cocktail presentations or in sautés. Colossal consists of the extra large lumps of unbroken meat, while jumbo lump consists of the two largest muscles from the swimming fins of the crab. Many users have the impression that the flavor of colossal and jumbo lump is better than other grades of crab meat. This is not necessarily true. The size of the lump is the only thing that really distinguishes these grades from other white meat grades. If a chef breaks up the lumps for a recipe, he could easily use another grade of meat. Backfin meat is ideal for upscale operations that feature crab dishes. Backfin is a blend of broken pieces of lump and special grade crab meat. It is perfect for crab cakes, sautés, crab toppings or cold salads. Backfin makes a beautiful presentation when stuffing fish, chicken, vegetables or seafood. 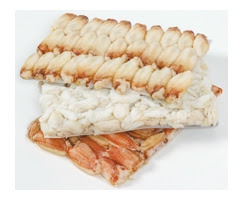 Special grade crab meat is often the most versatile grade for most recipes and quite profitable. It consists of the smaller flakes of white meat from the body of the crab—perfect for crab cakes, salads, quesadillas, wraps, stuffed mushroom caps and crab balls. It is individual pieces from the body cavities of the crab, but it carries the same bright white color and flavor as backfin and jumbo lump with an appropriate price tag for casual dining or quick service. Claw meat is from the swimming fins of the crab. It is brown meat with a stronger flavor profile which makes claw meat ideal for dishes with heavy sauces or in dips and soups. It is also ideal for price sensitive menu items. Crab cakes can be made with claw meat. Try a Thai crabmeat salad, a crab fritter, or crab spring rolls. Claw fingers are not a grade of crab meat. They are the pinchers or tips of the claws and they make unique hors d'oeuvres or garnishes. Wrap a claw finger with a crab stuffing mixture or serve them in a cocktail dish. They, too, are an inexpensive way to add crab meat to menus. Crab meat is available fresh, frozen or pasteurized. With pasteurization, fresh crabs are cooked and then allowed to cool. The meat is then hand-picked, graded and placed in cans, then hermetically sealed and pasteurized. Pasteurization destroys natural pathogenic microorganisms to extend shelf life without adding artificial preservatives. Once pasteurized, the product has a shelf life of 12 months in cans or refrigerated in plastic containers. This membership program is offered exclusively to customers of US Foodservice™. It is designed to help independent and multi-unit operators with the business side of their operations by saving significant dollars on non-food related services, saving time with online management tools, and providing tools to help increase traffic. There are currently thousands of Foodservice Advantage Club™ members saving countless dollars through the program. 1) Portion cut steaks offer consistency in size. When you order a 10 ounce center cut New York strip steak – you are delivered a 10 ounce center cut New York strip steak. 2) Portion cut steaks can be custom cut to your desired specifications. If your customer wants a bone in New York but don’t have a band saw to cut them – our Stock Yards fresh cut steak program can cut them consistently – every time! 3) Portion cut steaks thru our Stock Yards program are aged to perfection. Most sub-primal cuts are brought to distribution facilities with very minimal aging (3-7 days after slaughter) and are quickly sold to the end user. This does not give the beef sufficient time to age (break down the enzymes in the meat to make it more tender). Chefs and consumers alike will notice the distinct taste of a properly aged steak over a commodity cut steak. 4) Portion cut steaks deliver value. When you cut a Filet Mignon out of a tenderloin, what do you do with all the fat off of the side muscle? By the time a steak is ready to cook and put on the plate after trimming, it is conceivable they could lose up to 40% in trim. Stock Yards portion controlled steaks deliver ready to use product with 100% yield. 5) Portion controlled steaks offer an exact plate cost. When ordering a portion cut steak, you know the exact price per portion. This can help you gauge menu price to your customer for maximum and consistent profitability and plate costing. 6) Portion controlled steaks offer inventory control. When a customer orders a case of 20 x 8 ounce fillets, they will always receive 20 steaks per case. This helps to maintain inventory control over waste or theft. 7) Portion controlled steaks are offered in small box format. You no longer have to order a 60 lb case of New York’s to cut steaks from. Portion cut steaks can significantly reduce the possibility of lifting injuries. 8) Portion cut steaks take the knife out of the cook’s hand. Reduce the possibility of injury due to cutting the steaks yourself. Why give more money to workmen’s compensation insurance? 9) Portioned controlled steaks reduce labor. Whether doing large banquets for 200 people or serving dinner for 20 people, having a professional meat cutter portion the steaks for you can cut down on labor costs. 10) Portion cut steaks offer a variety of grades to choose from. Stock Yards Upper 2/3 Reserve, Stock Yards Choice, 1893 Select, and N/R brands all offer the quality and consistency within their respective grade tiers that our customers have come to expect from a premium meat company. 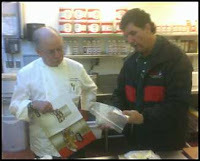 In May Bill Cox from Lad Foodservice was in Monterey showing, among other things, the new jumbo ravioli’s from Bernardi Pasta. Bernardi, a brand of Windsor Foods, is a maker of frozen Italian specialties that include these fantastic raviolis. On this day Bill was showing the Jumbo Crab, Jumbo Striped Eggplant, and the Jumbo Striped Cheese. very well with their rich colors that don’t fade after cooking. The filling was plentiful, with large chunks of Rock Crab clearly visible when cutting the Crab ravioli. There was a rich flavor to the Eggplant ravioli. Overall the product cut very well with the fresh pasta that the Chef purchases currently. 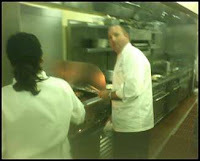 I found a web blog recently by a Chef Steven Karoly called Round the Chuck Box. 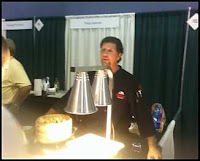 Chef has 35 years in the business and is looking towards retiring and running a camp kitchen in the mountains. His blog addresses the challenges and the solutions that he has found to dealing with the hectic nature of camp foodservice. 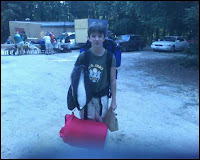 other side of the equation as in June the Isaeff family went to summer camp with the White Stag Leadership program. This youth program started in 1958 has evolved and challenged thousands of Boy and Girl Scouts in their personal growth. We arrived at the Camp Cutter Scout Reservation in the Santa Cruz Mountains above Boulder Creek on Saturday June 24th. The Kitchen Director, Chris Balog, had already been on site since Thursday and the delivery of the week’s food had taken place on Friday. Volunteers receive and store the products. Staff turnover is high as the kitchen here is run entirely by volunteers who come up for as little as one meal service up to the entire week. The challenge then is delegating manageable tasks to the good folks that wander in looking to help out. Chef Karoly’s has had some repeat staff which helps in continuity, but according to his blog he schedules in training on food safety, job assignments, and to orient the staff in the kitchen. graduation lunch on the final Saturday for about 400. Our Graduation lunch was a resounding success with a tip of the hat to Chef Steven Alton King of David Walley’s Resort in the town of Genoa, who provided the recipe for his almost famous Cowboy Sirloin Steaks! Primavera, and a salad bar. Fresh baked chocolate chip and oatmeal raisin cookies for dessert. Ribs 1 through 5 are located in the chuck primal. They have plenty of meat and have less fat than short ribs from the plate. English style short ribs are cut parallel to the bone and flanken style short ribs are cut across the bone. Chicago’s World Fair of 1893 was an event credited with introducing such culinary innovations as the Hamburger, Hot Dogs on buns, Aunt Jemima syrup, and Juicy Fruit gum. Just a few miles northwest of the fairgrounds, within view of the vast Union Stockyards that once made Chicago “hog butcher to the world”, the family owned meat packing company Stock Yards Packing Company was opening their doors. Stock Yards Packing Company was built on commitment to service, savings, satisfaction and selection. More than 119 years later, that commitment still shines- and descendants of the founding Pollack family still manage the Chicago operation. Here dedication to the customer is rivaled only by the depth of knowledge and experience of the associates, many of whom have been with the company for 20 years or more. From the Butchers to the Sales Managers to the selectors who pack the Angus Certified USDA Prime and USDA Choice aged beef for shipment to customers; everyone shares a meaty passion for excellence. Today, Stock Yards Meat Packing Company is a unit of U.S. Foodservice Specialty Operations. “The center of the plate is the center of the restaurateur’s world, and of ours,” says Southeast Region Stock Yards President John Bush, part of the sixteen packing plants positioned from coast to coast. He is referring to the fact that COP offerings represent the restaurant buyer’s single most significant cost. With famous white-cloth customers like Morton’s of Chicago, Gibson’s Steak House, Lawry’s Prime Rib restaurant, and the Westin Bonaventure Hotel in LA- along with scores of other elegant venues across the country. The whirlwind tour began on a Monday evening. Joe Prospero, key accounts manager was behind the wheel as we left town Monday night. We hopped on a plane Tuesday Morning arriving in Seattle around 8:00am. Within an hour, after meeting up with the other 8 people in our group, we were on our way to the historic Vance Hotel. 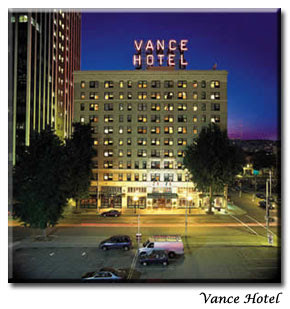 Built in 1920 by the lumber magnate Joseph Vance, the Vance Hotel is downtown and only blocks from the Space Needle, Pike’s Place Market, and other well known sites. The 165 rooms are called comfortable (read small) on their website but were more than adequate for this brief trip. The weather in Seattle was unexpectedly pleasant. Tuesday was sunny, clear, and in the 70’s. Not at all what I expected for Seattle, but definitely very welcome. We arrived at the Orca Bay Seafood plant at 11:00 for our tour. We were greeted by our hosts Mike Salas and Mark Tupper. In business since 1985, Orca Bay Foods is one of America's largest producers of table-ready portion controlled seafood items. Rather than owning a fleet of fishing vessels, Orca Bay has poured its energies into building a network of global sources. In doing so, the company is free to purchase the highest quality of fish and shellfish from a broad range of suppliers, worldwide. This nimble approach allows Orca Bay to react to market fluctuations and seasonal uncertainties, bringing reliably consistent fillets, steaks and shellfish to our customers year-round - not just when a particular fish is in season. Orca Bay products are frozen at sea to lock in the freshest flavor you can get short of going fishing yourself. Forget the old notion about frozen fish being less than fresh. That's because current technology allows fishing vessels to flash freeze the fish shortly after the harvest to lock in the "just caught" flavor and preserve the color and firm texture of the fish. Keeping the fish at or below temperatures of -10° F, they hand-cut the fish in single-serve portions so your preparation is a breeze. Orca Bay's state-of-the-art 15,000 foot FDA HACCP facility and four million pound racked cold storage mean they can service retail and food service customers with amazing responsiveness. Orders can be taken, processed, and shipped in a matter of hours, not days, giving you the products you want, when you want them.